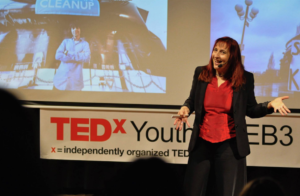 Claudia De Castro Caldeirinha addressed a young generation of future leaders in Brussels, in this year’s TEDx Youth titled “Is There a Limit?”. As an “idealist without illusions”, she believes it is fundamental that each person (all ages, genders, cultural backgrounds, etc) gives a contribution to make the world a better place – this starts in each person’s place of work, communities, etc. Today’s complex and turbulent world needs all talents and all people. And it needs values-driven inclusive leaders. Being a Leader is not always related with a formal role or title. Every person has the potential be a leader and make positive change in her/his workplace, community, etc. 6 First steps to be this type of leader, overcome limits & use “Super Powers”. Referring to multiple studies by top universities and companies showing that diverse people make better teams, more efficient organisations, and bring the innovation needed to solve complex and interconnected challenges, Claudia stressed “the magic of complementarity” of different profiles, genders, generations, cultures, backgrounds, religions, personalities and physical abilities. Claudia stressed that, in its simplest form, Leadership is about people who follow a vision, decide to act towards that vision, and eventually bring others with them. It starts with purpose, values, determination. Speaking about her experience working both with top formal leaders and informal anonymous leaders all over the world, Claudia shared stories of informal leaders -famous and anonymous– and how these have inspired her so much. Ordinary people doing extraordinary things (in their communities, schools, cities, regions…). People like Rosa Parks, the young afro-american woman who refused to give up her bus seat on a segregated bus.This wasn’t an act that was aiming to change the world — it was simply Rosa making a gesture to defend what was fair for her. Yet that simple gesture changed the world by bringing more attention to the civil rights movement and she became an icon for human rights. Concretely, Claudia has shared 6 First steps to become a leader, overcoming self-limiting beliefs & finding each person’s individual/different Super Powers.